It’s easy to identify the classic writers in any language but learning about the respected contemporary writers is much more difficult. The SPLALit blog has posted a listing of the best 100 novels written in Spanish during the past 25 years. The list is based on an article written by Semana, a Colombian magazine. Of the 100 titles there are 22 books by Argentine writers. Only Spain had more titles (32) in the top 100. Colombia was third with 13 titles. Okay, now I will be the first to admit that I’ve not read any of these books! In fact, of these 16 Argentine authors there are 7 that are new to me. The striking thing is how little is known in the English-speaking countries about so much world literature. In another post I’ll talk about the lack of translation for most of the titles. There’s a lot of work for literary translators. Unfortunately, very few publishers will publish works in translation these days. At # 47 Plata quemada, Ricardo Piglia (1997). As being discussed extensively on the BANEWCOMERS list, I checked my cable and found that the BBC and CNN channels are no longer available. Evidently, the cable companies have decided to charge extra for those channels or, perhaps, no longer offering those at all…I’m not sure…anyway, CNN International isn’t very good and the cable company was always pre-empting BBC for Senado TV. Fortunately, I’ve started to watch most of my news on the Net. There’s so many offerings online now that cable TV news isn’t so useful. Also, for those who haven’t discovered, a lot of the U.S. networks have their prime-time programming available online. Yes, it’s supposedly block to users outside the U.S. but there are a lot of open Web proxies in the U.S. that you can use to circumvent that restriction. An observation: in Bogota the cable TV service is much better than Buenos Aires. Not only do you get BBC and CNN International but also CNN USA (for you Larry King fans). Also, you get several other U.S. stations such as Fox News, not that I want to watch that. But, perhaps even better, you get CBS…Oprah and Dr Phil in the afternoons! It has been a while since my last post but it’s time to get back to posting more frequently. I already had a copy of the second volume of this work in English but I wanted to get all three volumes in Spanish. 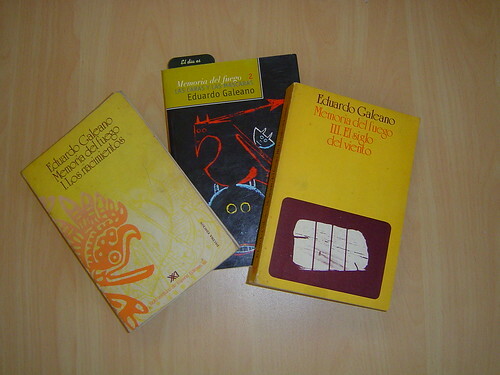 I had assumed, initially, that finding these three books by Galeano would be rather simple in Buenos Aires. After all, Buenos Aires has a lot of bookstores, people read a lot in this city, the books are definitely not obscure and Galeano is a well-known writer in this area. Indeed, just before starting my search I did happen to see volume 3, El Siglo del Viento, at the Musimundo on Florida. But I figured then that I could easily find it elsewhere and didn’t want to give my book money to a place like Musimundo. A few days later I went off to El Ateneo on Av Santa Fe. It’s such a gorgeous bookstore but, honestly, I seldom find the books I’m looking for in El Ateneo especially when it comes to literature. Of course, one of the difficulties with locating Memoria del Fuego (or most books by Galeano) is defining the genre. Is it history? Is it literature? Or a little of both? Generally, all the Galeano books (and he’s quite prolific) are shelved together but the easiest is to ask the store clerk. Then I wandered over to Av Corrientes. I’m very familiar with the selections in the used bookstores on Corrientes and knew that I’ve not seen Memoria del Fuego before but I tried again. I also tried Libreria Hernandez, which I often feel has a very good literature selection. (As a side note, I do think that Libreria Hernandez definitely has the best English literature in Spanish translation). But no Memoria del Fuego at Hernandez. Then I thought Gandhi, that’s a really good bookstore. They’re sure to have….but nope. The sales clerk at Gandhi was quite helpful and suggested trying Parque Rivadavia….more on that later, but I wasn’t yet ready to give up the search in a regular bookstore. Heck, I even checked the Musimundo on Corrientes but they didn’t have it and neither did Zival’s. I was getting concerned by this time and was wondering what was up with this book. After all, the Washington Post called this book “an epic work of literary creation”. So, why is it so difficult to find in Buenos Aires, the city that prides itself on its bookstores? I headed down Callao to check out the little bookstore at the back of Clásica y Moderna. They have a quality selection. But the woman there said that they didn’t work with that publisher. Hmmmm. Then there’s another small bookstore on Callao just down from Clásica y Moderna. They didn’t have it either. But the clerk said that he believed the book was going to be reprinted later this year. Fine and good, if true, but I wanted the books now and not months later. So, I finally decided to head back to Musimundo on calle Florida and buy the volume 3 that I had seen there earlier. But, of course, once I finally make it back to the store I find that the book is no longer there. Okay, the hunt wasn’t over. I went down the street to try the El Ateneo on Florida. The clerk looked baffled and said that they hadn’t had those books in a long time. But he said that they did have El fútbol a sol y sombra by Galeano. No! I didn’t want just any book by Galeano and I certainly didn’t want one on soccer! Then I went across the street to the Cúspide. They didn’t have the book but their in-store computer reported that the books were available at both the Cúspide branches on Santa Fe and in Village Recoleta. Yeah!!! So, I hiked up Av Santa Fe from Florida to the Cúspide store just past Callao. I think that whoever manages that store is a frustrated librarian. The store is organized by very specific subject matter. Anyway, they didn’t have the book either. Sigh. Okay, so I went over to Village Recoleta, again where the computer states all the volumes are in stock. Like most Cúspide stores the Village Recoleta branch is arranged in a matter so that it’s almost impossible to find a specific book without asking for it. And why was I not surprised when the clerk said that they didn’t have the book in stock? But what about the computerized inventory stating that the books are in that store? The clerk says that the inventory is wrong. Memo to Cúspide: Spend some money and fix your computerized database! Otherwise, what’s the point of having it? Oh, amusingly, the young guy working at Cúspide quickly pulls a slim green volume from the Galeano shelf and says that they do have El fútbol a sol y sombra. Memo to guys working in bookstores: I know this will sound weird but not every guy in the world is a fútbol fan. So, trying to find Memoria del Fuego turned out to be a long, frustrating process and it was finally time to try the used book stalls in Parque Rivadavia. At least, it was a good excuse to take the A line on the subte. 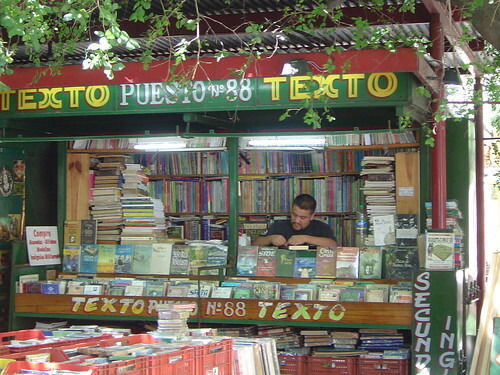 The booksellers at Parque Rivadavia are similar to the used bookstores on Av Corrientes. For the most part, both have about the same selection. At Parque Rivadavia you have to go around to each book stall. Each seller has a very good idea of his offerings so it’s easiest just to ask. I felt really lucky when halfway through the stands we found one seller with the first two volumes. Hurray! But what about the third? Found it at the very last book stall in Parque Rivadavia. Success!! Of course, none of these sellers seemed to have multiple copies so if you go searching now for Memoria del Fuego in Buenos Aires then you probably will just be out of luck until the books are reprinted. Oddly, the last time I was in Walrus Books, the best English language bookstore in Buenos Aires, I did see all 3 volumes of Memory of Fire by Galeano in its English translation. So, in this case, it’s easier to find the English translation of a book by a noted South American writer than it is to find the original Spanish. Something is wrong about that. Of course, it’s likely the publisher’s fault for not printing enough copies rather than the fault of the booksellers. But the booksellers could be a lot more helpful. I recall being surprised by the staff at Border’s in Aventura, Florida when I inquired about a book that was not in the store. Rather than offering to order the book for me, the person at Border’s immediately got on the phone and called the Barnes & Noble down the street, which had the book. I went to B&N and brought the book that day but became a regular visitor to the Borders in Aventura just because they were so helpful. Well, at least, I finally found Galeano in Buenos Aires. Continuing my ongoing theme of Italian immigration to Argentina I’ve come across a posting at the Olive Tree Genealogy blog about an individual who has posted the passenger list of the ship Federico that sailed from Genova, Italy to Buenos Aires in March 1961. I’ll be interested in hearing personal accounts of anyone who immigrated by ship from Italy to Buenos Aires. There must be a lot of interesting stories among those who made the journey.